Just strong, the 12 CS. Cold smoke, but fresh and citric sweet. Slightly rainy tar and gum abrasion. Not a bit snappy, rather gallant and inviting, while modestly concealing the power that is in him. The sweet smoke from the nose, it comes directly to the tongue. He is strong, but not nearly as strong as the 58% suspect. Wonderful, though (because?) Undiluted. Mildly smoked fish, tar, seaweed, salt, pepper, machine oil - everything is there. In addition, always tart sweetness of lemons, sometimes grapefruit. Long and dry, ash flakes from the campfire (wood and peat soil), lemon sorbet and slightly peppery. [July, 2003] Together with friends I emptied a bottle that I bought for 65 Euro in November, 2002.In my old rating system (ten scales that translate into WB points: 50 - 66 - 75 - 80 - 82,5 - 85 - 87,5 - 90 - 92,5 - 95) I scored this 90. My notes state a clean and flawless "naked" Lagavulin. N: nice peat reminds me of 70's Ardbeg or caol ila from about 1980. For me it is a bit more difficult to get under the peat. 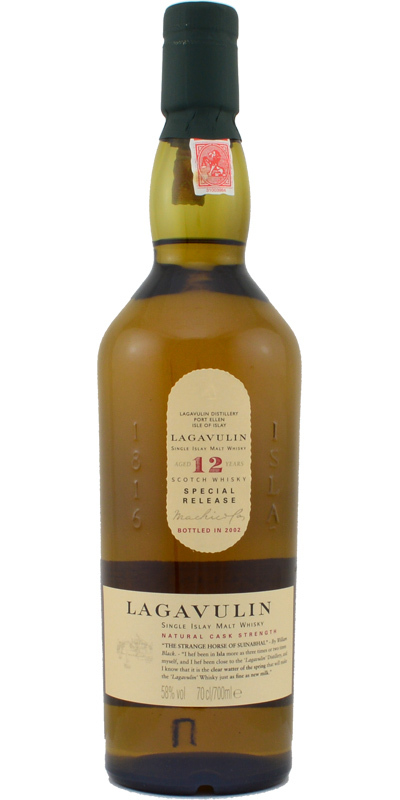 Enormously powerful Lagavullin. Spicy, peaty with a nice smoke and some bitter herbs in the heavy body. Should be diluted with water to produce better oaky notes.